Handwriting is an important functional skill for any child. Throughout the school day, children are expected to use handwriting to communicate their thoughts, express their ideas, and answer questions. The importance of handwriting in school curriculum has diminished in recent years. Some administrators and teachers feel that technology is a priority and handwriting is becoming less important. That is not true. 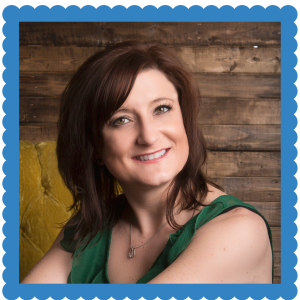 The education field is trendy, and right now handwriting is not a popular topic. That does not mean it isn’t important. 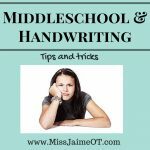 Handwriting IS an important functional skill and it always will be! That said, there are fewer opportunities to work on handwriting skills at school. Parents and teachers can try to work on handwriting by combining it with other subjects or by emphasizing neat handwriting during homework time. 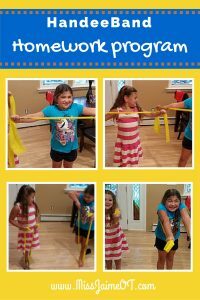 One way to incorporate handwriting into the school day or into your home life is to combine Handwriting and Play. I am a firm believer that handwriting should be taught with formal instruction. Formal instruction means that a teacher teaches the children the name of a letter, what sound it makes, and models HOW to write the letter. A good solid handwriting program incorporates multi-sensory methods to help all children (visual learners, kinesthetic learners, etc.) gain the awareness of the lesson. However, once children have been taught how to write the letter, they need to practice. Practice makes perfect, they say! Sometimes handwriting practice can be perceived as boring, but combining handwriting and play is a great way to keep it fun! Class instruction that includes Handwriting and Play is always fun. Tic Tac Toe is the perfect game for combining Handwriting and Play to work on letter formation. 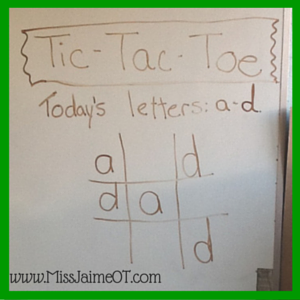 Simply set up a page with tic tac toe boards and write the letters that you want the kids to practice at the top. For example, if the kids need to practice the letters a and d, they play with those letters instead of x and o. Simple, but genius! I would recommend some kind of visual explaining the letter formation to the kids on the page or on the board if possible. This is just so the kids know that they need to write the letter properly. It’s not a free for all! Old fashioned Hangman starts by writing the entire alphabet. Teachers can choose lowercase or capital, print or cursive. This is a great way to get the whole class writing. 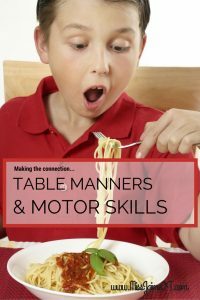 Parents can practice with a quick game after dinner or when you are stuck in a waiting room. Everyone is always tempted to pull out their phone during a few minutes of downtime, but it can be fun to combine handwriting and play. 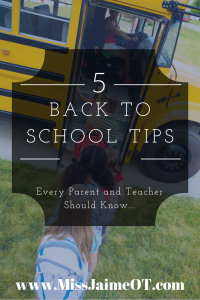 Plus, nothing beats one on one conversation and connecting with your kid. Word Scrambles are also an easy go-to handwriting game. Simply write a short phrase on the board, “Happy Valentine’s Day!” or “It’s cold out!”. Children need to scramble the letters up to make as many words they as they can using the letters in the phrase. This is similar to Boggle in that it gets children listing words and word families, which is also a great review. I often encourage teachers to create a “handwriting center” when the class breaks into groups. In my classes, the teacher and the teacher’s assistant each take a small group of children for reading instruction. The rest of the class work “independently”. 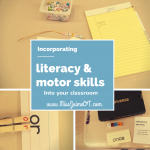 It is important to consider the level of the children when choosing how to incorporate handwriting and play. If the children need to work on sizing or spacing, independent work like the word scramble or a board game is fine. See the advice below for how to adapt for different ages. However, if children need to practice letter formation (how to write each letter properly), independent work is probably not a good idea. As I stated earlier, children really need to be taught how to write the letters. Handwriting is not automatic, so handing out a worksheet or assigning a Journal topic where children are expected to write letters that they haven’t mastered is not best practice. Playing a game that involves handwriting but doesn’t teach the letters isn’t a great idea for this handwriting goal. If you do something incorrectly over and over, THAT becomes automatic. So why would we set our kids up to learn something incorrectly? We wouldn’t. So, with that said, there is a problem. How do we let the kids play a Handwriting Game if they aren’t being supervised or if they haven’t learned the letter yet? It’s tricky, but it can be done! 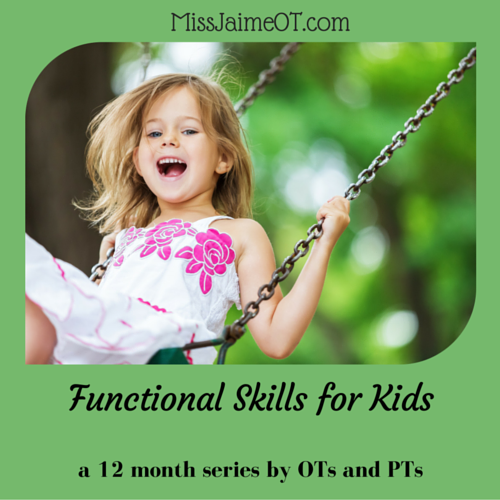 Check out the #functionalskillsforkids blog hop by #pediOTs and #pediPTs! 1. Break the activity down into one tiny skill. Rather than working on all lowercase letters, work on two or three. Break the letters into groups by letter formation – this way the kids are learning ONE specific skill (how to write diagonal letters like v and w). 2. If some of the children have mastered the letter and others have not set up a buddy system. The Handwriting Without Tears Program incorporates a “write it and check it” into their handwriting pages. The kids can do this with their buddy, as long as the group has mostly mastered the letter. Make sure the kids know to check for how the letter is being written, NOT what it looks like. 3. If they haven’t learned how to WRITE the letter, let them do other activities with the letter. For example, circling all of the “lowercase b’s” on a page with lots of letters. The children aren’t physically writing, but they are seeing the letter over and over, recognizing what it looks like, and separating it from other letters. Plus, it’s fun! The visual memory of the letter really important. 4. Don’t be afraid to combine technology with writing! If your class has tablets or Ipads, set the kids up on a handwriting app! The tablet won’t let them write the letters incorrectly, so you don’t have to worry! Use games on the smartboard that emphasize visual memory or grouping the letters, too. The kids are having fun, but you are still combining Handwriting and Play. *One piece of advice for handwriting apps and tablets in general – make sure that you have set up “guided access” in the settings of the tablet so that children can’t change the app and do whatever they want. They are often used to just changing whenever they feel like it. You can set it up so they are “locked” into the app. Older children have often developed poor handwriting habits. Many handwriting “games” can be used to address handwriting legibility, sizing, spacing, and on-line orientation. Additionally, they can be used to work on rhyming, spelling, and word families. 1) Make sure the kids know that they are working on handwriting while they play. Often kids get caught up in the “play” part and they forget to focus on handwriting, too! Have the kids submit their papers to you after the activity. Make sure you check them, make corrections and hand them back. If the children see that handwriting matters to you, it will matter to them. 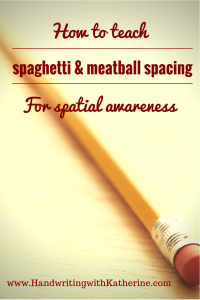 2) Use graph paper or Redispace paper to work on spacing or sizing for any handwriting game. Try raised lined paper to work on sizing and on-line orientation. As mentioned before, Scattergories, Boggle, and Hangman are all fun games that incorporate handwriting. 3) Use the opportunity to incorporate script if your student needs to improve in this area. 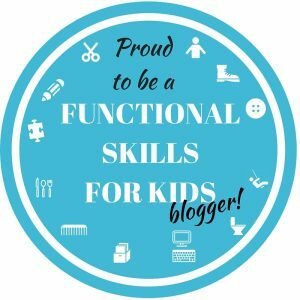 Don’t forget to check out our Landing Page for the Functional Skills for Kids Blog Hop! 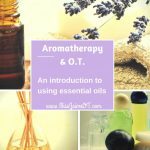 Check out the rest of Miss Jaime, O.T.’s Posts in this series here. Check out the rest of January’s posts about Handwriting! 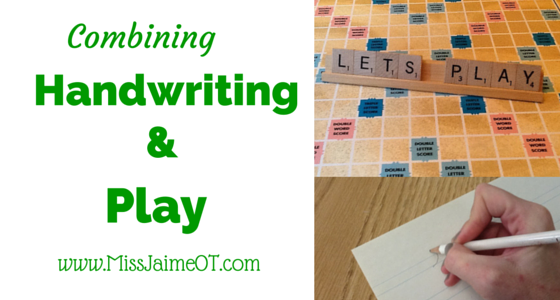 Do you have any great ideas to combine Handwriting and Play? Please share! 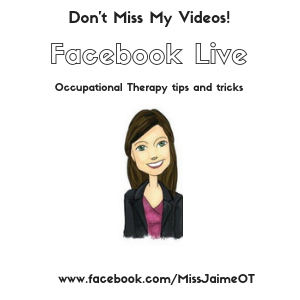 Subscribe to Miss Jaime, O.T. to get the checklist delivered to your email. Success! Now check your email to confirm your subscription and get your reward chart. Thanks Margaret! I will add this to my post! Appreciate it! Kids love hangman and they don’t even realize all the handwriting and drawing practice they are getting! Thanks Anna Meadows! It makes it so much more fun! Thank you Anna! It makes handwriting practice so much more fun! Great tips here! Combining a task like handwriting with play is so helpful and makes working on skills fun! Thanks for sharing these ideas. I LOVE word games! 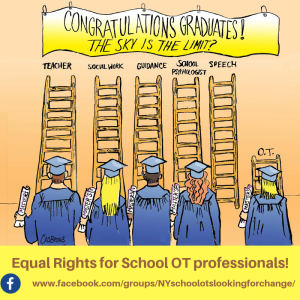 I love your ideas especially tic tac toe and hang man which will be so easy to incorporate into OT sessions! Thanks! Such creative ways to work on practicing letters and writing. I had never thought to adapt Tic Tac Toe into a letter formation game. Brilliant! Thanks for the inspiration. I put a series of dots on the white board, about 5 across and 5 down, each spaced about 1/2″ apart or so. The kids and I play a turn taking game connecting the dots and trying to make a “box”. Whoever makes the box gets to put their initial (or whatever letters are being practiced) in it. Great combination of visual motor, handwriting practice and writing on a vertical surface! Group of kids?? Just use more dots! Great ideas Amy! Can’t wait to try that!